spazsinbad wrote: First line of 'news' says FOUR whilst Three are described locationwise - so where was the fourth location? I marvel at the size and deflection of those rear stabs. Is it known which of the three had the IFE? Shouldn't it be 911? for EMERGENCIES! C-5 is for Fire Truck (Keep On Truckin'). Can anyone describe the purpose of that open panel on the left hand side of the photo Spaz just posted? 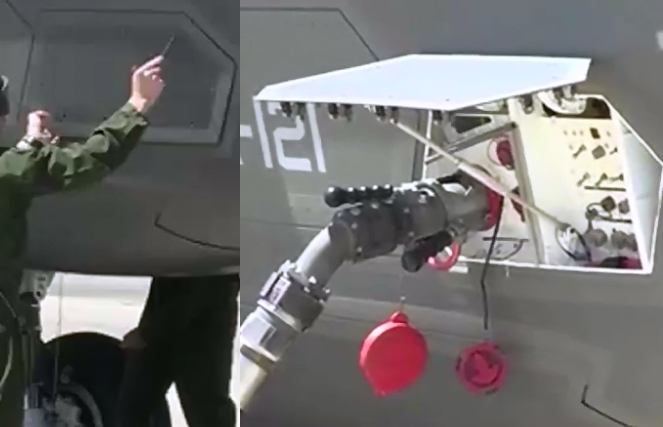 IIRC the big red connector is for fuel and there are other fueling & diagnostic connections and controls. It's the same panel that ripped of in Japan while in flight. Once you know what to look for, I found a bunch. This is the best shot of the cable, controller, and connections. Thanks - that is a good one. Looks like he discharges static electricity through the thin wire wot goes to ground out left. So, whaddya think? Another case of in-flight, premature door ejection? If that is the case, at least they didn't lose the panel door this time. 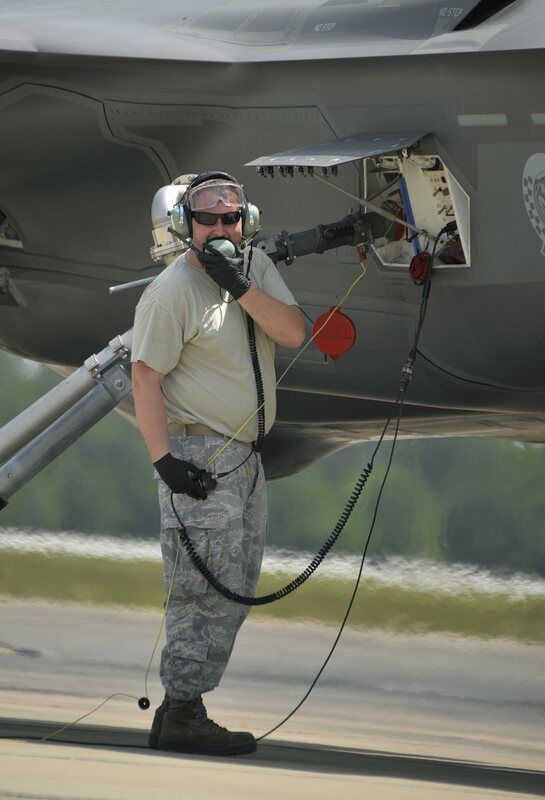 The first responders talk to pilot to know more - that airfield least familiar with the F-35 most likely although they would have publications to help with 'emergencies' because most likely that airfield is a designated 'emergency airfield' for 'Lantic Xings'. After this talk people with appropriate gear may appear but for now the aircraft is on the ground parked and ain't goin' nowhere fast. Lots more gabbin' phonin' and hoohaa to come methinks. Glad everyone is OK though. Aircraft has a minimal CHOCK of just the nosewheel probably put there by the firemen before the pilot exited. NOICE aren't they. The open panel is just a maintenance interface panel; it is not designed to withstand air loads. 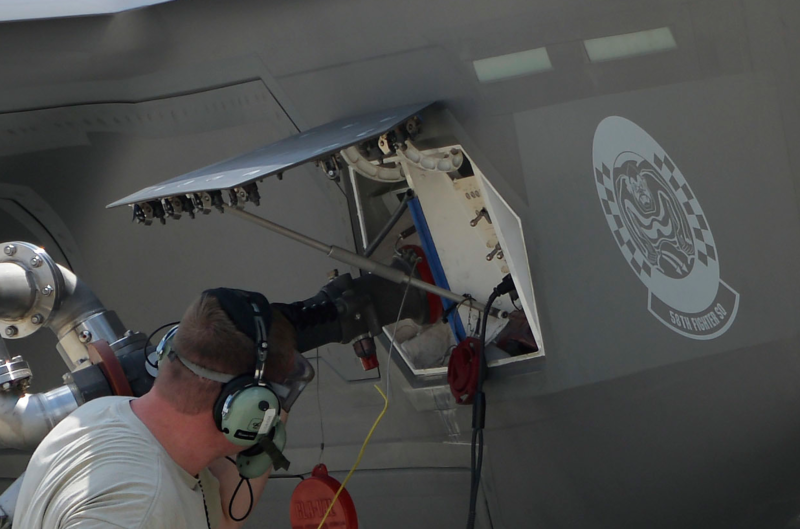 As indicated in the pics, it is manually opened by ground crew using a ‘T’ handle (Hornet guys are very familiar). In one of the pics you can see that there are 11 fasteners on the panel, each simply opened or closed using aforementioned handle. Inside the panel there are a variety of conduits and controls that allow the maintainers to communicate with the pilot whilst the engine is running or to check, actuate or service different aircraft systems without entering the cockpit — this includes connection of a PMA (portable maintenance aid — i.e. a tough book laptop). Fixed and flew away to meet KC-10 from McGuire AFB en route Israel with a weekend stop in Lajes. Welcome ceremony schedule to Sunday (June 24th) afternoon in Nevatim AFB. Together With the new three members (916,917,918) 140FS will have 12 Adir birds out of 24. 3 page PDF attached from FLY MAG No.1 2018 (Scandi Av Mag in English) about ADIR F-35i IOC.